I have to say that I’m definitely one of the many who have been fooled by the label on the tin. The last word in the title is not Beermaster … which is what I thought it was but Veermaster … a German sailing ship. Despite the confusion with the name this tobacco, I was thinking it was for the King of Hamburgers and Beer, (maybe that’s me anyway) it has certainly turned out to be a very nice smoke with some great flavors. The tin aroma is sweet berries, similar to other "Navy Flake" styles, like Mac Baren Navy Flake and Peterson University Flake. If you like those, you’ll love Hamborger Veermaster. Actually, the tin aroma on this one is even sweeter, perhaps raspberry. However, it doesn’t bite at all. This is a very fine tobacco. I’m sure one of those flavors I’ve detected reminds me of a BBQ sauce - sweet and tangy. It’s a very tasty Virginia that packs a lot of punch in the nicotine department. My first bowl got me a little buzzed. In addition to the sweet & tangy sensations, some of the sweet berry tastes come through, and as you progress, it changes to a berry herbal tea taste. I really enjoy this tobacco. Hamborger Veermaster was perfect for smoking straight from the tin. It was just ever so slightly moist. It is a flake and rubbed out quite easily into small ribbons to easily pack your bowl. In the pipe it burns well and burns slowly so if you like to linger over your pipe … and who doesn’t … then this is a tobacco that will last. It burns down to a very fine white ash that is a fine powder. I love Hamborger Veermaster and unfortunately, it is no longer made. So if you find it, buy all you can. It’s a comfortable smoke that you can enjoy when you just want to sit back and let the world roll by. Slippers, a hot drink and a warm fire come to mind when I think of this tobacco, just relaxing and recharging. 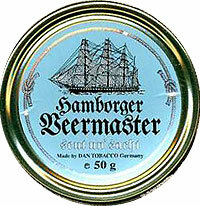 UPDATE DEC 4 2010: Hamborger Veermaster is in production again, so look for it at your favorite tobacconist. 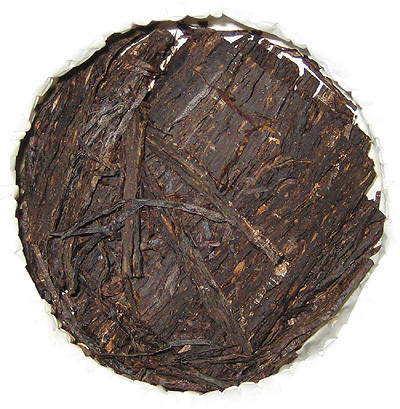 Tin Description: Classic sailor’s flake tobacco made from rich Golden Virginias, sweet and mild. Here’s a look inside the tin. Click the image for an extreme close-up. I have not tried this tobacco yet, but it looks like I will have to add some to my next tobacco order.